As a frequent business and leisure traveler, I have long kept a compact folding toothbrush in my go-bag. That's why I was really excited to be invited to review Doctor Plotka™'s Travel Toothbrush. I used it for the first time during a recent business and am very pleased with its design and how well it works. This is not your ordinary travel toothbrush. Most of the other travel toothbrushes I have used were not made with the same level of quality as an everyday toothbrush. Instead, they seemed to be lesser-quality toothbrushes that you could get by with for a few days. However, that is not the case with this toothbrush. Its quality matches (or exceeds) a standard toothbrush, and its design is perfect for packing. Developed by Dr. Ronald Plotka, a practicing dentist with more than 40 years of experience, this is a high-quality toothbrush that really meets the needs of travelers who want a convenient and compact way to keep up with oral hygiene on-the-go. It made with specialized features designed to maximize oral health in a compact, travel-friendly package. Folding design: The folding design means that it doesn't take up much room in your cosmetics bag or luggage, which is a great benefit to travelers. Sturdy construction: Even though it is small, though, the toothbrush is sturdy. Both the brush head and the handle feel well-made, and the handle is comfortable to hold. Transparent handle: I particularly like the fact that the handle is transparent, which makes it easy to see when cleaning is needed. The last one I used before trying this item had an opaque handle, so it was not as obvious when cleaning was necessary. Cleaning power: This toothbrush has unique bristles, designed with the unique insights that only a dental health professional can offer. For example, the toothbrush has two-layer "flossing bristles™" to help clean in the grooves between teeth as you brush, as well as keeping your teeth and gums clean. The bristles are also antimicrobial, so they help keep the toothbrush clean and ready-to-use. Long-lasting: The polyester bristles used to make this toothbrush are designed to be particularly long-lasting. The American Dental Association (ADA) recommends replacing your toothbrush every three to four months. You can expect this one to last for the longer timeframe (four months), while most other commercially available brushes will likely need to be tossed out closer to the three-month mark. 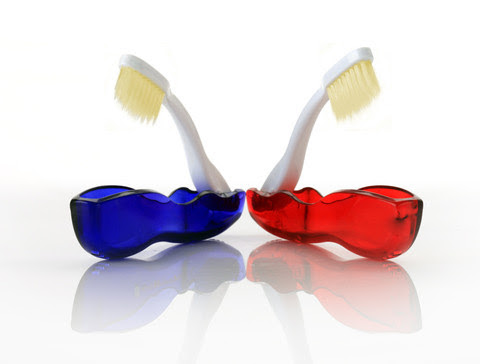 Color options: Choose between red and blue handles when ordering your toothbrush. Dr. Plotka's Travel Toothbrush is a great item to add to your collection of personal hygiene travel supplies. At just under $6 each, these brushes are a must-have item for anyone who spends much time on the road. You can order online from Mouthwatchers.com, or purchase from a variety of stores, including Whole Foods Market and Sprouts Farmers Market. Note: The author received a free sample of this toothbrush to review. The opinions provided here are her own.